Born 08/19/1973, Detroit, USA. Died 09/30/2010, Detroit, USA. Deep house, techno and electro-funk musician / producer. Founder of Wallshaker Music and WARMTH International Inc. (a collective devoted to preserving Detroit electronic music). Hosted a weekly internet radio show called The WARMTH Sessions. 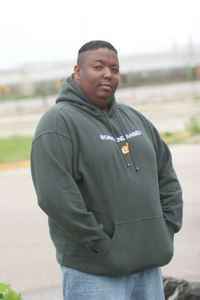 Aaron-Carl was diagnosed with cancer (lymphoma) in late 2010 and passed away September 30th, 2010. When is he going to release a new single or album? Man this really is sad. Them Detroit producers are such a small but dedicated and important family within the electronic music. Losing someone within this circle really does sets it's mark. I been tailing the Detroit scene for a time now, and Aaron-Carl's music was just so down to earth real and genuine. "Sky", "Down" & "Crucified" has made Aaron recognizable but he has made many more good and inspiring tracks. My thoughts doesn't just go out to his son, family and personal friends, but also to his Detroit brethren within music that look out for eachother. The city has lost one mighty soul. Thank you Aaron for your wonderful music, it was really tragic and sad to lose you. RIP Mr Aaron Carl. The music world needs more like you. I remember our discussions about scheduling the W.A.R.M.T.H. tour in Europe. When he knew about the cancer, he was still the same: a fighter!! Aaron always had cool words, you could talk with him about everything. When it was about music, sometimes he was rude, but you knew he was right... and incredible selector and a so extensive knowledge... I am so respectfull for all that things he did and even more, because he gave me the confidence, he was always around! His tracks are timeless, from the first to the last ones, listen the music and hear that so unique voice, missing him is a real lack for the entire House Music scene, a master and a monster of producer from Detroit that used to bless our souls with his "Wallshaker" beats. Love you for ever AC, R.I.P. True Legend! Really sorry to hear of Aaron's passing, Crucified was and is an all-time favourite of mine. RIP and thanks for the music. Aaron you will be missed. I am so sad that you have gone so soon. We love you and you will stay in our hearts. I had been looking for 'Down' for ages - it wasn't until I went to Aaron's web sit that I realised 'Down' is the B-side of 'Wash It' my favourite 'filthtech' track of all time....and I've had it in my collection for 5 years - how stupid do I feel!!!! 'Down' is like a cross between DBX, Aux 88 and a New York builder in a frock circa 1979. I love this record...Aaron, you're a genius!